Yes! Please send me my FREE copy of The LUNAR Handbook! Do you ever feel stressed out and overwhelmed? What if I told you that the universe has a FREE gift for you that can help you reduce that stress in your life? 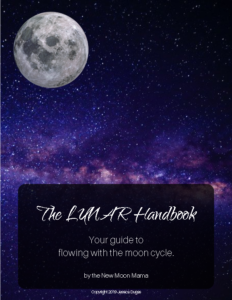 Your PDF handbook includes: A Look at LUNAR Flow, The LUNAR Flow Cheat Sheet, 2019 Lunar Calendar & Lifetime Access to Future Calendars, Your Lunar Cycle Worksheets, AND a Getting Started Guide! *Bonus* This free gift also gives you access to my inspirational daily emails!